Meet Dacia Little Rudd our September Business Woman of the Month! Recently, Dacia got candid with us and shared her journey in being a wife, creative, and professional woman! Check out more below! I was born and raised in Warner Robins, GA before moving to Atlanta in 2009 to attend school at Georgia State University. At GSU, I completed my bachelors in Journalism with a concentration in Public Relations and a minor in Marketing. Currently, I work at an advertising agency that specializes in multicultural marketing efforts for large companies such as Publix Super Markets and Georgia-Pacific. In my spare time, I support my husband’s car customization business, Laced by J5, and brainstorm new ideas for our podcast, Tripping Over the Broom—a series of topics surrounding dating, marriage, life and everything in between from a newlywed millennial perspective. I’m not all work and no play though! On my off days I enjoy outdoor activities, exploring new things, eating, and hanging with friends. What a busy schedule! As millennial women, where do we fit in with Laced by J5 and Tripping Over the Broom? Laced by J5 is a car customization business that specializes in vinyl wrap services, light tinting, decals, and commercial wraps. We can turn your car into a rolling a billboard or simply make it stand out from all of the other vehicles. Millennial women love to put a twist on “norms!” Right now Laced by J5 does not see a lot of millennial women as customers but we know it just means we haven’t found each other yet. You can learn more about the services at www.lacedbyj5.com. 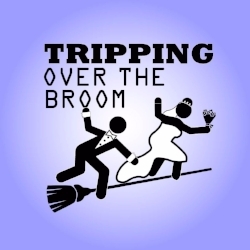 Our podcast, Tripping Over the Broom, is all about different perspectives and relationships. Everyone has a story or a point of view and our platform is open for anyone to share to their thoughts. We love having guests on our show or contribute to our blog. Please visit SoundCloud.com/trippingoverthebroom or check your favorite podcast app to listen! The Tripping Over the Broom blog stories are at http://www.trippingoverthebroom.com. If you could recommend any book to other ladies interested in business, what would it be and why? Right now, I’m reading “Ask and It is Given: Learning to Manifest Your Desires” by Esther and Jerry Hicks. I haven’t finished it yet but it’s all about the laws of attraction. This book is helping me focus on the things I want out of life and teaching me to manifest my own destiny.